We've teamed up with Titan Bet to offer all our readers a free £5 bet on sports betting. All you need to do to claim the free bet is simply sign-up with the firm, register your name and address and then you'll be credited with the free fiver. No deposit is needed. Don't miss out on what is rightfully yours! 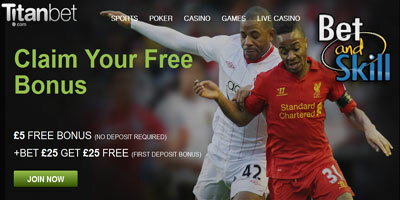 Find here how to get your £5 no deposit bonus now! 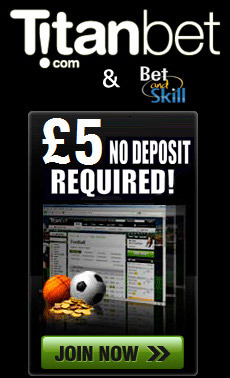 Get your £5 no deposit free bet here!! How can I use my free bonus?To place a bet with your free bet token, simply select your bet, enter the amount you would like to wager and then select the free bet token inside the bet slip by checking the appropriate box. Important their bonus system doesn't work with mobile phones so you will need to register on a desktop to qualify! 1. This offer is valid for new players arriving from BetAndSkill.com. A 'Like' on Betandskill's facebook page or twitter profile is required. 2. The 5 free bet is only available to players who register with Titan Bet during the course of the promotion, and do not have any previous accounts with Titan poker/Titanbet. The free bet and winnings accumulated by the use of the bonus are subjected to removal in accounts which appear to be duplicated at the discretion of Titanbet. 3. Your free bet bonus will be displayed next to your real balance in the top toolbar and in the bonus information found inside the "my account" section after registration. 4. Free bets cannot be used via mobile devices. 5. Your free bet bonus does not have to be placed as one whole bet and can be split into smaller amounts. The free bet can also be combined with real money as part of a bet's stake. In order to use your active free bet token to place a bet you must enter the stake in your bet slip and check the box which will be displayed under “Available Bonus Tokens”. 6. Your free bet is valid for use on single, multiple or system bets at Titan Bet sportsbook only. It is not valid for Titan Bet casino, Titan Bet games or Titan Poker. In the case that winnings from a system bet are smaller than the free bet stake, the winnings will still be credited to a player's balance. 7. Your free bet bonus is valid for 7 days. Any part of the bonus that remains after this time will expire. 8. Free bets are for wagering purposes only. Thus free bet stakes are not included in any returns. 9. Returns from your free bet will go directly to your real money balance. 11. In the event that a free bet selection is cancelled, declared void or returned as money back, your free bet will be returned to your free bet balance and you may use it to place a new bet. 12. Players must deposit at least $20 and wager the first deposit on sports bets at least once in order to withdraw free bet bonus winnings. 13. Should there be winnings accumulated from the free bet, the first withdrawal can be a maximum/minimum of 100($/£/€) in free bonus net winnings. Any deposited funds will be excluded from the total balance for the purpose of this condition (ie if you've generated 50 in free bonus net winnings and deposited 70, the net winning amount is 50 and in order to withdraw you must accumulate at least 50 more net winnings from sports bets). The second withdrawal will be approved after a deposit will be made and the deposited amount wagered on sports bets. 14. Amounts are equivalent in different currencies ie $10= £10 = €10 = $10 = =CAD10 = AUD10 = DKK75 = NOK75 = SEK100 = ZAR100. 15. This offer cannot be used in conjunction with any other promotion or special offer. 17. Titan Bet reserves the right to review transaction records and logs at any time, for any reason whatsoever. If, upon such review, it appears that customers are participating in strategies that Titan Bet in its sole discretion deems to be abusive, we reserve the right to revoke the entitlement of such customer to the promotion and reclaim the bonus element of the promotion. "Titanbet no deposit bonus £5 free bet! (Betandskill exclusive)"